Ever wish that you could double the size of your monitor? This may be beyond your budget, but you can get a similar effect by using two monitors side by side. As an example, on the left monitor, you could have your genealogy database open. On the right monitor, you could have the Internet open and view census images. If you find information in the right monitor, just copy and paste it into your application on the left. 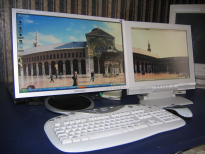 If you have digital images on your computer, you could use the right monitor to view your digital image collection, while on the left you could preview one of the images at full screen. This is also a great solution for transcription projects: View a document image on one screen while typing into a word processor on the other.